Ok. I know what you’re thinking. You want to see a magic show, but you don’t know where to go. Well, as it turns out there is one happening tonight. 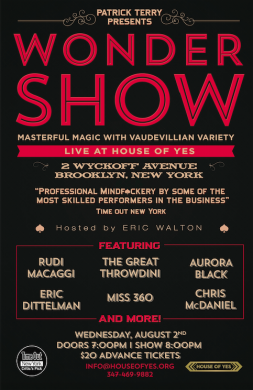 While you ooh and ahh over my magnificent mind-reading skills, Wondershow is gearing up to show you mind-bending tricks at the Bushwick venue with some of the bendiest bodies I’ve ever seen, House of Yes. Wondershow is hosted by magician and mentalist Eric Walton. I would explain his work by relating it to someone else’s, but the event description calls him “incomparable,” and I don’t want a magic spell to be cast on me if I disobey. The show also features mind reader Eric Dittelman (of America’s Got Talent), knife-thrower The Great Throwdini, “Western variety arts” master Chris McDaniel, and ballerina/burlesque performer Aurora Black. For those ageless or nostalgic folk mourning the loss of the early 20th century burlesque and vaudeville shows that used to be so commonplace in areas like Midtown, surely you’ll be in for a treat. Thursday, December 1 at The Annoyance Theater, 9 pm: $10. Surely many of you have taken a crack at reading David Foster Wallace’s behemoth of a novel Infinite Jest; perhaps some have even gotten through the entire thing. Or maybe the idea of parsing through a book so large it could double as a weapon seems daunting, and you’d rather sit in a basement watching a comedy show that vaguely riffs on the novel but is set in a vaguely dystopian future where the NFL is in cahoots with the government. 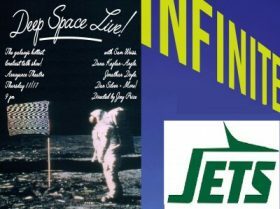 In that case, Brian Pisano and Sam Taffe’s sketch comedy play Infinite Jets may be the thing for you. Our current future prospects aren’t looking too hot, so might as well laugh at a made-up future before ours becomes all too real. The show comes as a double feature with Deep Space Live, a late night talk show set in space hosted by a man whose only friend is a robot. Comedy duo Marina Tempelsman and Nicco Aeed (featured on Comedy Central, Funny or Die, and UCB) kick off a residency at The PIT with a five-hour marathon of murder and mystery. You know, the relatable stuff. Consisting of eight 30-minute episodes presented back to back in the style of radio serials, the episodes feature laughs, suspense, and a live Foley artist. And don’t worry, there’ll be breaks between episodes so you can refresh yourself with some drinks.